Questions? Just let Chris know via Comments and we’ll get our resident geeku to help you get organized using Google products. Let’s talk about file management. Clearly there are huge benefits to having your files Cloud-based. Because you can access them anywhere that you have an Internet connection, and if your personal computer decides to spontaneously combust, there’s no worry about recovering your files. True story: Just last week one of my colleagues’ laptops overheated to the point the plastic melted. No company files were lost because they were stored in Google Drive. So what’s so great about Google Drive? 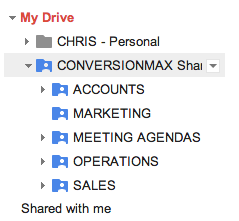 If you set up the folder structure and sharing permissions incorrectly in Google Drive, you can get into trouble. Let’s say you’ve been working late on some very important files; you save them in the appropriate folder, and need to access them during a meeting in the morning. But, your well-meaning colleague decides to move the folder into a “better” location. The next morning you open up your trusty Google Drive only to find that the folder AND the file are not where you left them. OOPS. Meeting ruined. Boss angry. Not good. Don’t worry, those files are not gone forever, but you’ll have to do some detective work to find out where the heck they have been moved to. Something you can’t do in a hurry, especially if you have a complex folder structure. Designate one person, or a SMALL group of people as administrators of your company’s folder structure. Train them in best practices for file management, so they understand how to manage sharing permissions. Then have the administrator create a root folder where all the other files will be saved. In the root folder, give only a small group of company officers or personnel edit access. Within this folder, have the various other folders that you decide to create for the company (Sales, Marketing, Operations, Accounts, and so forth). Note that any new sub-folder or document you create within an existing folder will inherit the sharing permissions from the folder above it, so you’ll need to set sharing permissions for each folder individually. The image on the right shows an example of a sub-folder structure within the folder “Meeting Agendas” above. By moving your files to a Cloud-based system, you’ve already created a backup system, essentially. You’re trusting that Goolge will protect your files, and I’m willing to bet they’re safer there than doing your own backups. But, as a best practice, you should also develop a system for multiple backups for worst case scenarios. A few weeks after I moved a bunch of files to Google Drive and gave a presentation about how great it was, I got an error message when trying to access my files. Huh? What’s this? I thought Cloud-based file management was fail safe! I definitely had an oh $#!T feeling that made me realize the importance of a secondary backup, even for reliable Cloud-based systems. Luckily, all I had to do was log-out and log back in, but it makes you stop and think for a minute. Human error also comes into play with file security (you know what I’m talking about if you’ve ever deleted an important file by accident). And if you think you might be able to call Google begging for a copy of “yesterday’s backup,” I wouldn’t count on it … have a look at Google’s file deletion and recovery policy. The bottom line is: use and enjoy the simplicity of Google Drive, but also have your own backup system in case something crazy happens. To keep your files safe, I recommend setting up an external hard-drive backup at least once every 24 hours. 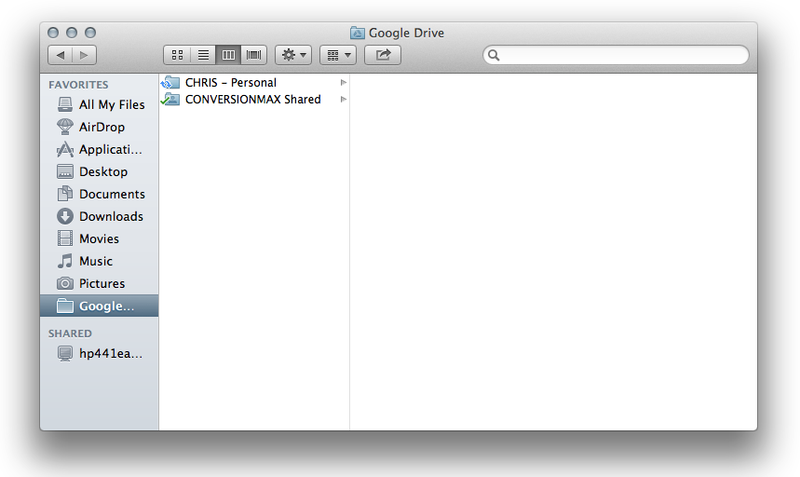 The files kept in your Google Drive can also be set up to live in a special folder within your computer (see screenshot above). This is a nice feature if you want to work offline–as it enables you to backup your Google Drive files from your personal computer. The more I use Google Drive the more I like it, and I would definitely recommend it for small-to-medium-sized businesses looking for a way to improve their file management system. Thanks for reading! If you’re using Google Drive and have additional ideas to share about best practices, I welcome your comments! Chris brings more than 11 years of experience in project management and writes about applying that to web. Over the years, he has worked in many different roles including strategic planning, marketing, sales, accounting, and customer relations management (CRM). Chris' goal is to bring the various parts of the company together for a seamless and high-quality experience for clients. Chris holds a B.A. degree from Linfield College and has studied marketing, web development and digital media. He's also a Google AdWords Qualified Individual. As an avid outdoorsman, he enjoys skiing, cycling, backpacking, and landscape photography. He also enjoys time with his wife and two kids, ages six and eight.